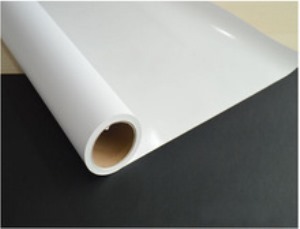 This Self Adhesive vinyl has a special and unique glossy high-resolution surface coating. Produced prints are of photo quality and colours are vibrant. Ink dries quickly and produced prints will not smudge or get destroyed by moisture or even when totally submerged in water. The product is primarily for indoor use, but it can also be for outdoor up to 3 months if printed with pigmented inks. The product has permanent adhesives, which stick just about to any smooth and clean surface. It is advisable that the product will get tested for adhesion to a specific substrate before usage. It is compatible with all inkjet and bubblejet printers such as H.P., Epson, Encad, Canon, Kodak Lexmark, Olivetti, etc. For all types of original water based inks: dye, pigmented, ultrachrome, K3 and vivera. You can print on it using an inkjet printer. Cut out your ‘sticker’ and apply it on a surface that is not excessively exposed to sunlight/rain. This is not meant for fabrics.